Any tour in India will be incomplete without the visit to the amazing and exotic wildlife of the country. Hey! Hang on! We are not encouraging you to pack your bags and take off to the dense wilderness of the country to have a view at them. There are other ways too. Ranthambore Park is situated in the state of Rajasthan. It is a very enclosed area, which is considered a tourist spot in itself. It is a Project Tiger Reserve of India, established to preserve the population of the national animal of the country. Not only tigers but also you may see many predators and dry deciduous forests here. Various lakes and forts also increase the adventuring spirit. India is also famous for its exotic Wildlife Sanctuaries. Read about the top wildlife sanctuaries across the nation. Jim Corbett National Park is located in Uttarakhand. It is also a Tiger Reserve Project of the country preserving the endangered Bengal Tiger. This oldest park in the country is considered as the perfect adventurous destination. It is a perfect fit for an Eco tour with amazing natural bounties as well. Bandhavgarh National Park is a popular national park in the central Indian state of Madhya Pradesh. It has dense forests and the wildlife is the most exciting features you can explore. Along with the important member tiger, a lot of leopards and deers can be seen. It is situated on the Western Ghats touching the borders of Tamil Nadu. It is very popular for its sheer beauty and tourism. This park also comes under the Project Tiger Reserve of the country, and also offers jeep safaris for its tourists. The beautiful lakes and rafting on them enhances the fun you experience. It is popular as a World Heritage Site and is situated in the north eastern part of the country Assam. It is famous for its rare one horned rhinoceros. It is also a Tiger Reserve. It can also be applauded for water buffaloes, elephants and other animals. Enjoy the grasslands and sights of Brahmaputra River. Have an exciting and peaceful stay in Assam. The splendid mangrove forests of Bengal are included within this area, which got its name from the throngs of sundari trees. Sunderbans is also acknowledged as a World Heritage Site. It has amazing river bodies and forest areas. Bengal tigers, crocodiles and snakes are some creatures you can spot here. 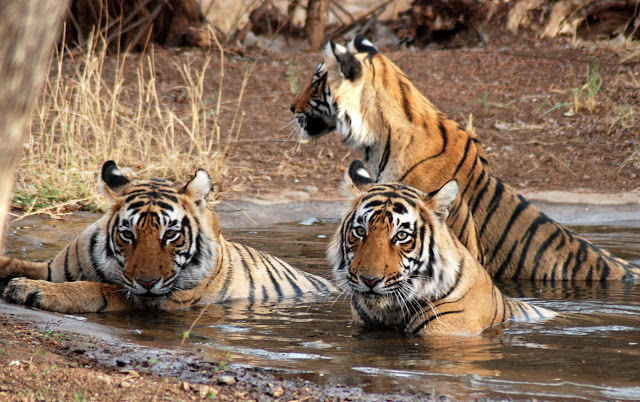 Kanha is a popular Tiger Reserve of India located in Madhya Pradesh. With brilliant flora and forest areas, this park is famous for its sloth bear, leopard, wild dog, and of course the Bengal tiger. Visit this park for an adventurous time exploring the wild beauty of the country. Mudumalai has a very scenic location in the Nilgiri hills located in the Tamil Nadu state of India. This park is also acknowledged as a Tiger Reserve and also shelters that endangered elephants and leopards. And you can also see various prey birds like vultures etc. This is another World Heritage Site situated in Bharatpur region of Rajasthan. It is famous for the various species of birds and migratory birds like Siberian cranes. This park is also popular for its wetlands and grasslands. Come and explore the wonderful and mesmerizing wildlife in India on a wildlife tour. You will be awestruck in each destination!